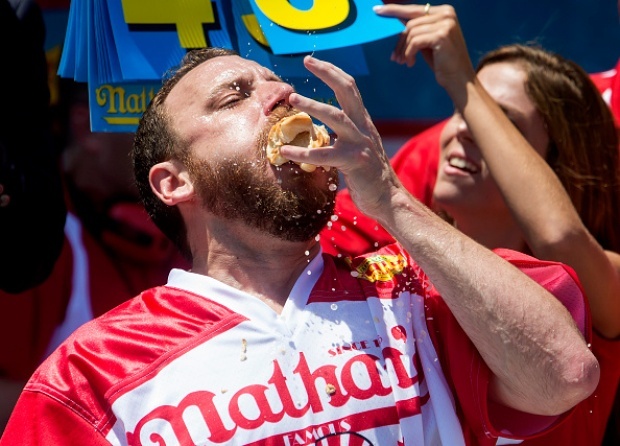 Joey "Jaws" Chestnut regained the Mustard Yellow International Belt Monday, ousting Matt "The Megatoad" Stonie of the championship title at the annual July Fourth hot dog eating contest at Nathan's Famous in Coney Island on Monday. 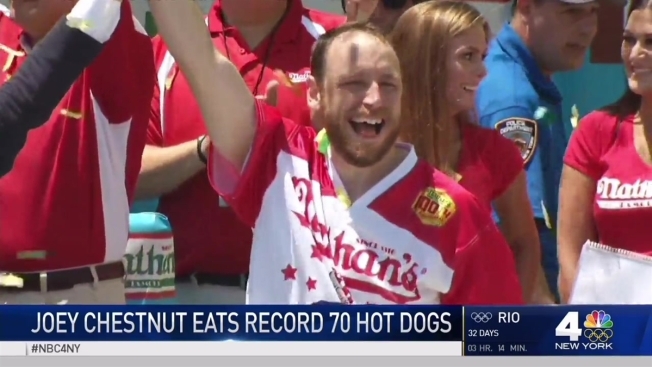 Chestnut, 32, downed 70 hot dogs and buns in 10 minutes - the most hot dogs and buns ever eaten at the competition - polishing off 17 more dogs than Stonie. Chestnut's eight straight victories ended last year when he lost the championship title in an upset to Stonie. Both men are from San Jose, California. As he gripped the mustard-colored belt after his win Monday afternoon, Chestunt said Stonie had "woke up the sleeping giant" when he beat him out last year. Stonie said there were "no excuses" for his loss. He said Chestnut did an amazing job. 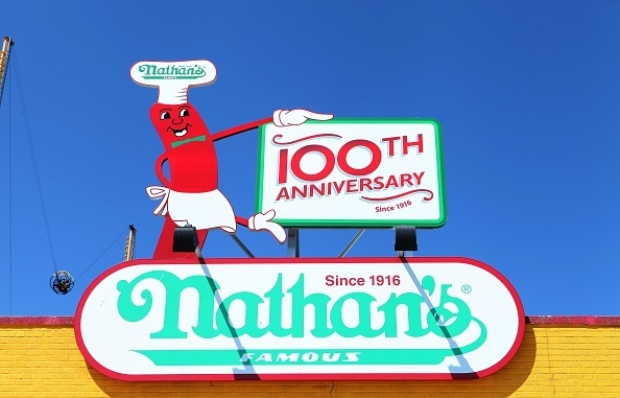 With thousands of people - many wearing Nathan's Famous hats - watching the eaters on an elevated stage along the famed Coney Island boardwalk, the next closest competitor ate 41 hot dogs. Both men are from San Jose, California. In an interview last year, Stonie said the two aren't great friends, but they do hang out occasionally. That the No. 1 and 2 top eating champions both hail from the same hometown, isn't all that weird, Stonie said. "Living in California, people think a little differently," Stonie said at the time. The men's contest came more than an hour after the women competed, with defending champion Miki Sudo capturing first place. Sudo, 30, downed 4 1/2 more wieners than prior champion Sonya "Black Widow" Thomas, 48, of Alexandria, Virginia, who devoured 34 hot dogs. Thomas had held the championship title from 2011 until she lost in an upset to Sudo in 2014. The colorful holiday tradition draws its share of characters. Many in the crowd Monday wore foam hats shaped like hot dogs. One man held a sign that read: "Make America Eat Again," a play on presumptive Republican presidential nominee Donald Trump's campaign slogan, "Make America Great Again."